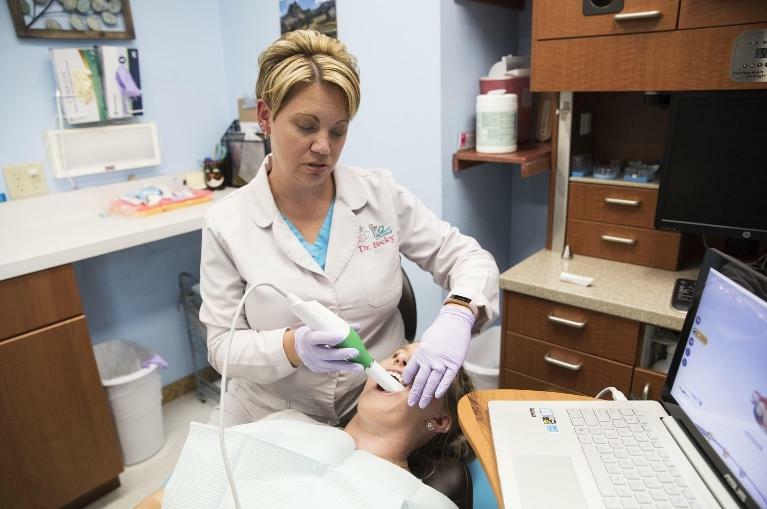 We are proud to offer modern dental technology and techniques to our patients so you can enjoy the most comfortable, efficient, and effective dentistry possible. Feel free to read on to learn more about the technology we use in our practice. Our office has invested in the PlanScan system for the in-house fabrication of all-ceramic dental crowns. This is a CAD/CAM (computer aided design/computer aided manufacturing) system that allows us to take digital impressions of the prepared tooth and then use computer software to create a customized crown that is exactly right for the specific tooth in that particular patient's mouth. The crown is then milled (cut) out of a block of ceramic in our PlanScan mill, followed by the application of stains and glazes to further customize the crown, and finally fired in a very hot oven (like a kiln) to finish the crown and make it shiny, tooth-colored, and strong. For your crown visit, there is typically no need for any gooey impression materials to ever be placed in your mouth. Our educated staff will use a digital scanner (small wand) to obtain the digital impression which gives the computer all of the necessary information of the prepared tooth, the opposing teeth, and the way that your teeth bite together. The scanner uses LED technology to capture the anatomy and you can even watch the scan appear in real-time on the computer screen. Most patients agree that digital impressions are significantly more comfortable than the typical methods of gathering dental information with bad-tasting impression materials! The PlanScan mill is a large machine that uses diamond burs to cut a crown, bridge, or veneer from a solid block of ceramic. 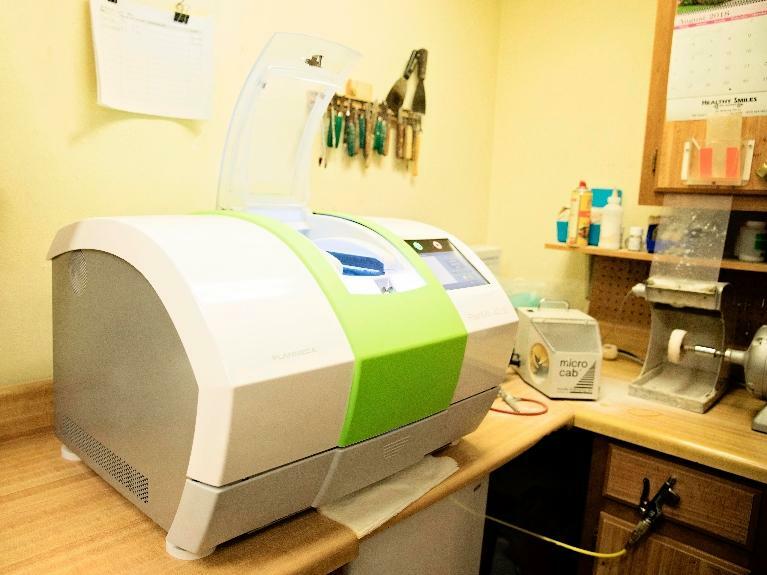 The mill sits in our in-house lab and we use it daily to fabricate beautiful restorations for our patients. It takes about 10-15 minutes for the machine to mill out a single posterior (back tooth) crown. 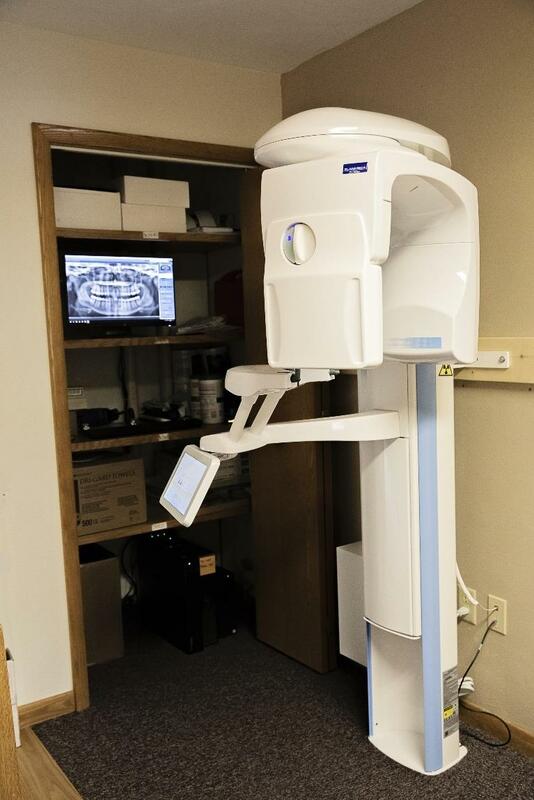 Our CBCT machine allows us to gather extra information when regular dental x-rays are not enough. A CBCT scan uses x-rays to create a 3-dimensional image, providing exact information about a patient's teeth, bone, nerves, sinuses, and other anatomical structures. In our practice, the CBCT machine is used most frequently for implant consultations and to check the position of impacted teeth. By having this technology in our office, we are able to provide accurate recommendations regarding implant placement and impacted teeth so that you can be treated in the most favorable manner. The CBCT scan is an extremely low-dose x-ray and will only be ordered by our dentists if it will aide in your diagnosis and treatment planning. Our office uses a soft tissue laser as a means of "friendly tissue cutting," as Dr. Becky likes to say (as opposed to cutting tissue with a scalpel or electrosurge). In many dental procedures, it is necessary for soft tissue to be trimmed. This includes procedures like the removal of a fibrotic scar tissue lesion, trimming gum tissue in order to properly fill a cavity along the gumline, uncovering an implant after the healing phase, or exposing an impacted tooth prior to orthodontic movement, just to name a few. The soft tissue laser may be used without anesthetic, although many times the patient is already numb for the procedure prior to the use of the laser. The laser is "friendly" because it cauterizes as it cuts, therefore leaving a relatively painless, clean, and fast-healing surgical site. There are certainly still procedures that will require the use of a scalpel, but our office will often opt for the soft tissue laser for less invasive soft tissue cutting.